Choosing beginner violin music is crucial in helping your little musician maintain interest, review technique, and push their abilities to the next level. I've got some great music for you that will do just that! If you clicked on the-violin.com, you're probably in need of 'beginner violin music' or 'free sheet music' or almost anything else 'violin-related'. So, why stop at the-violin.com for the answers when you could find the answers yourself by searching online? Because, a professional violinist and long-time teacher of beginning students (that's me! ), has spent hours of researching so you don't have to! Combine that with her expertise and years of experience in teaching music and you have a winning solution to finding music that you like, at a price you like (after all I am also a coupon-saving, bargain-shopping mother of five myself!). With just a click of the mouse, you now have a brief summary of all the best beginner violin music, free sheet music links, and violin resources at your disposal. No more frustration with dead-end links, or buying products you are unsure about. Look below for the beginner violin music category that interests you. Finally a free sheet music site that has true-blue beginner violin music! 8notes.com....Perfect Free Sheet Music Site For Beginners!!! Click Here. Easy songs for the player who has most basic notes and bowing techniques learned. Movie themes for the beginner to intermediate player. A Good Beginning Book Worth Buying. "String Builder" for beginning violinist starts on open strings and slowly adds one or two fingers at a time. By the end of "String Builder Book 1", the student will know all notes in first position, have a firm understanding of using the bow, and learn the basics of rhythm and note duration. The songs are short, and fun. String Builder is also sold in viola, cello, and bass too, making it perfect for orchestras as well as for individuals in private lessons. I remember learning from this book as a young violinist and now I teach from this book. "String Builder" is a perfect complimentary note reading book to any method or music you are currently using. I found many positive reviews on "String Builder" like this one. I knew nothing about playing music and musical notation, let alone playing a string instrument. I wanted to learn and did a bit of research on self-study books. In the end I bought a whole stack from various sources, including Suzuki. I found the String Builder to be the absolutely most logical and user friendly approach. All other books frustrated me, but String Builder is very easy to follow, and takes you through very logical exercises that are never boring or too hard. 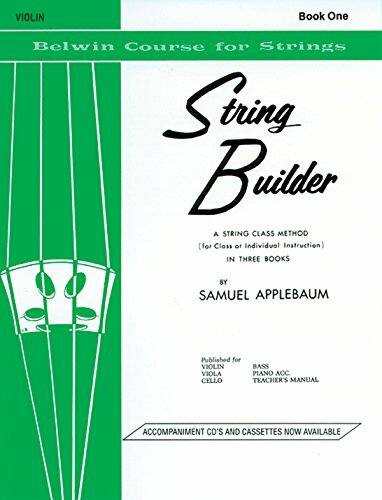 The only drawback that some teachers and students have expressed is that "String Builder" introduces the two middle strings first and the Suzuki books begin on the top two strings. 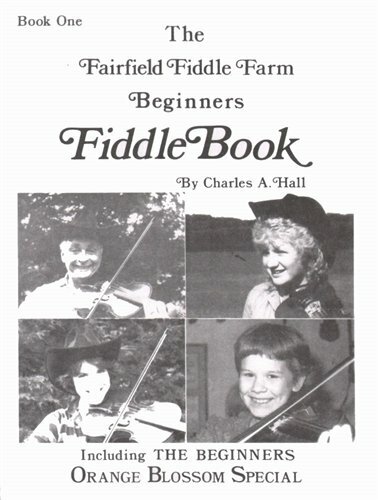 Fairfield Fiddle Farm Book for Beginners - The Fairfield Fiddle Farm Book is a MUST have for your beginner. Mary had a little lamb is the very first song in this book, but it's a fun bouncy version. You'll also find beginner versions of Old Mcdonald Had a Farm, Bile em Cabbage Down, and Orange Blossom Special. My kids have played these together (piano and violin) for school talent shows and it is always a hit! Plink, Plank, Plunk! - is a fun and entertaining solo. It combines pizzicato with bowing. The violinist must have a decent understanding of most notes in first position before beginning this song. The Puppet Show - This is a must for anyone looking for beginner violin music. In fact, it was the first solo I ever performed at a recital. It combines left hand pizzicato with right hand bowing so it is very alluring to students and fun to play. This piece has a lot of melodic repetition which makes it nice for memorization and quick learning. With this song, students will gain experience of playing an actual 'solo' with different fast/slow movements and variations. 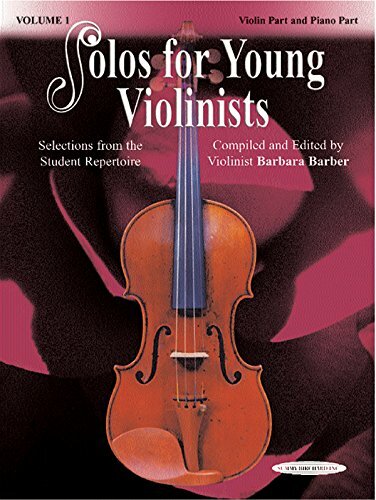 Or look for Solos for Young Violinists, Volume 1 compiled by Barbara Barber it is an excellent book that contains Puppet show plus 14 other wonderful solos for the beginner. 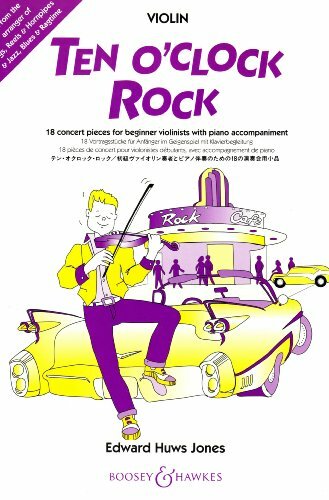 I talked to my wonderful violin teacher the other day, and she was very excited about a book called "Ten O' Clock Rock". She said that she really likes it and that it has also been very popular with her students. Of course I had to run right out and find it and it does look fantastic! V.I.P Strings sells some products that I really like. Some of my favorite VIP products are "Rainbow Tones", "Sight Reading Variations" and "Fiddle Fiesta". I have found that students are motivated and enjoy playing more when the music has a really full and lively piano accompaniment part. "Rainbow Tones" is a book for beginners that has just that! The other thing that is fun about V.I.P music is that the only place I have seen it sold online is their website. When you have a recital, concert, or competition, not everyone has this same book. So the music is fun, new, and exciting. Welcome to our music directory. Follow these great recommendations in orchestra, holiday, and beginning violin music. Spice up the repertoire with something new and learn how to find free sheet music online. Tired of all the food blogs and DIY home improvement pins? Welcome to a place that explores a fresh topic in a down to earth way. A professional violinist, mother of five, and music teacher dives deep into the world of the violin. There's plenty of fun practicing ideas to pin, how-to videos to watch, violin reviews to study, and reasons why you will want to start playing today! "Like" what you see? Find us on social media as well! Hi I'm Steph, a mother of five crazy, smart, stubborn, talented, trouble making musicians...er I mean kids. Violin is my thing: I teach others to play, practice whenever I'm not folding laundry, squeeze in a couple of performances a year (my audience may or may not typically consist of stuffed animals and little people) and love finding creative ways to get my own kids to practice. Before the cuties came a long, I received a degree in Elementary Ed with an emphasis in music because I think kids and music go together like peanut butter and jelly! We love bringing you free violin information, but it costs us money and oodles of time. When you complete a purchase on Amazon using our product links, we receive a small commission at no extra cost to you! So, thank you for helping us fulfill our mission of "Music in Every Home".